Sharpton and Omarosa took turns blasting the president along racial lines and she also repeated her claim that President Trump is a racist. Sharpton and Omarosa are blasting President Trump to advance their own agendas. 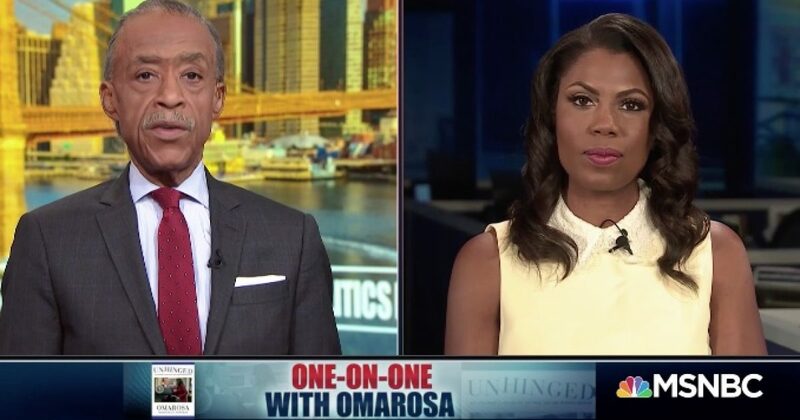 Omarosa is making outrageous claims to sell as many books as possible and Sharpton wants to keep black Americans trapped on the Democrat plantation. Sharpton’s popularity depends on keeping blacks angry but recent polls show President Trump’s popularity is rising with black voters and this threatens Sharpton’s power. For example, a recent poll by the NAACP reported a sharp rise in black approval of President Trump. The Left is going to try to make the most out of Omarosa’s wild claims about President Trump but at the end of the day, black Americans will judge the president on his accomplishments, specifically, how their lives have improved under the president’s policies.